I missed two blog entries last week due to an annual golf trip to Ireland. 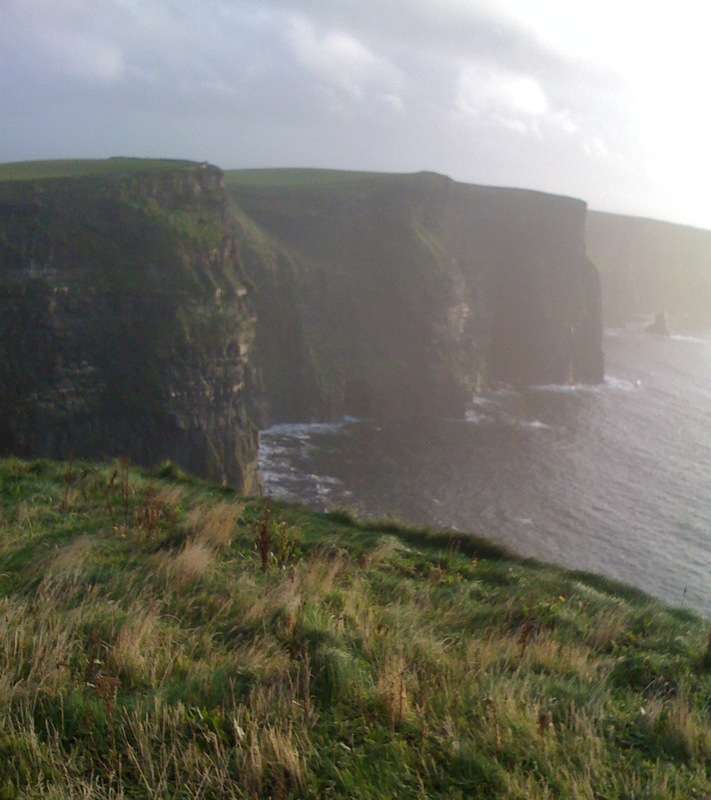 This year, we went to the West, in County Clare and the Galway area. After playing a gorgeous round at Lahinch and before an unbelievable plate of stew at Gus O’Connor’s pub in Doolin, we stopped briefly at the breathtaking Cliffs of Moher. Standing on O’Brien’s tower gives you a 700 foot vantage point on Galway Bay with the Aran Islands barely visible out in the Atlantic. It’s a spectacular spot and thanks to both our tour guide Tim and Wikipedia, I learned that it served as a backdrop for The Princess Bride, the latest entry in the endless line of Harry Potter movies, and even the hazy cover art for U2’s recent album, No Line on the Horizon. Along the walk up, the tourist bureau posted a series of warning signs. It may be true that much like Scotland, Ireland and the United States are two cultures separated by a common language, but really, a few words may have been in order to help clarify the meaning of these imaginative, if over-reaching symbols. 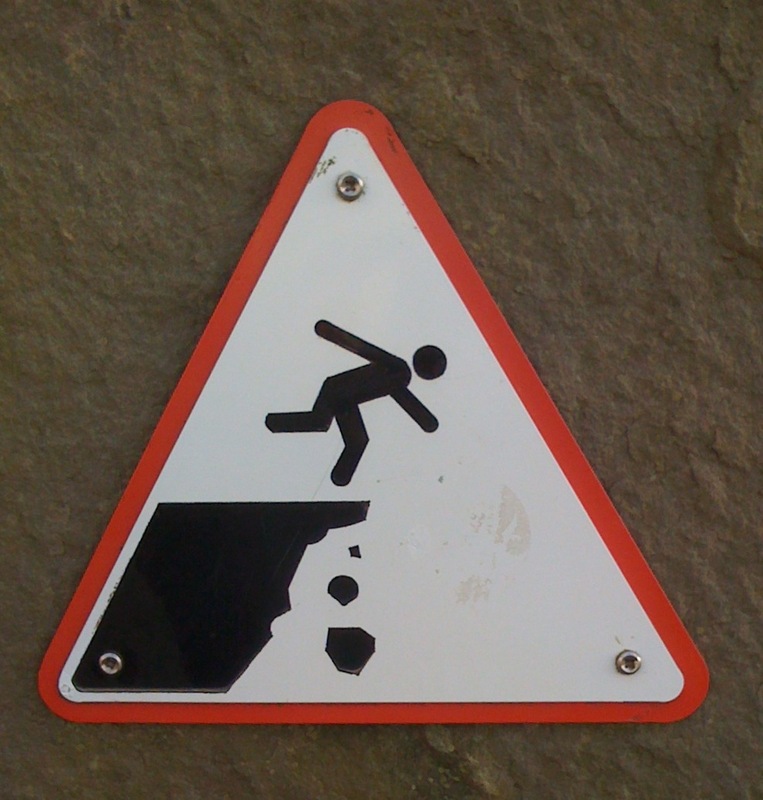 They started simply enough with Sign #1: a triangular-shaped warning that sprinting along the edge may cause both damage to the cliffs and an ungainly posture. Indeed, this simple visual messaging would easily translate for visitors from most any culture around the world. Sign #2 however, began the descent into indecipherability. It could mean ‘please don’t kick the oversized black piano keys’ or perhaps ‘no hurdling gravestones.’ Maybe it means that ‘climbing shipping boxes of framed paintings requires two hands’ or perhaps even something as prosaic as ‘no dancing too close to obstructions of any sort,’ but that seems unlikely given the Irish proclivity for enthusiastic if ungainly dancing. No, Sign #2 remained something of a mystery to our group, but whatever it warned of, apparently we were able to walk away unscathed and apparently, without egregious violation. Sign #3 though totally lost it with the implied intent. ‘No hovering at altitudes higher than the local birds’? 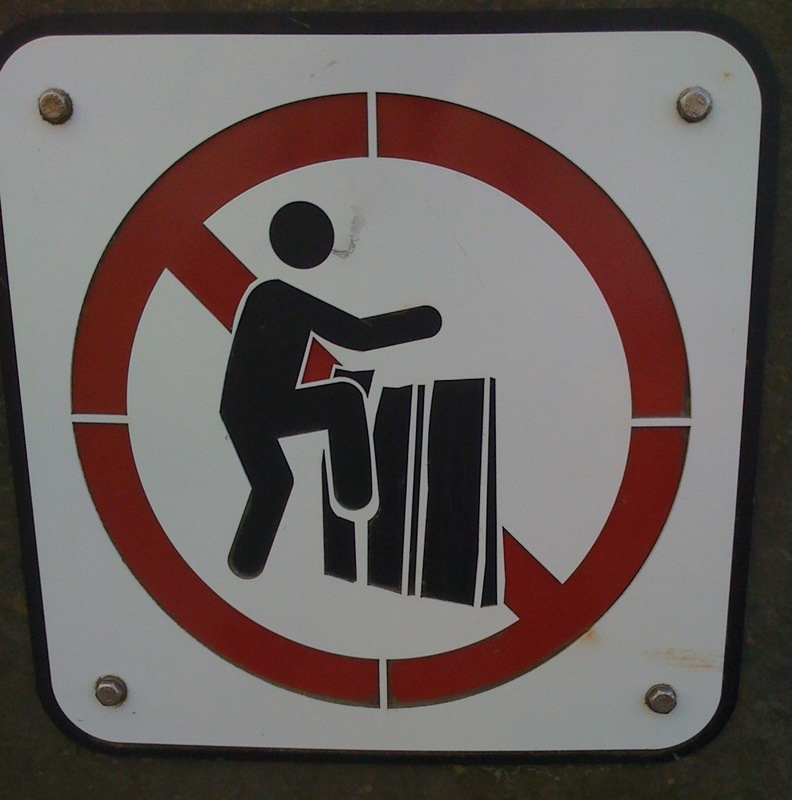 ‘No walking on flaming coals while littering candy wrappers’? 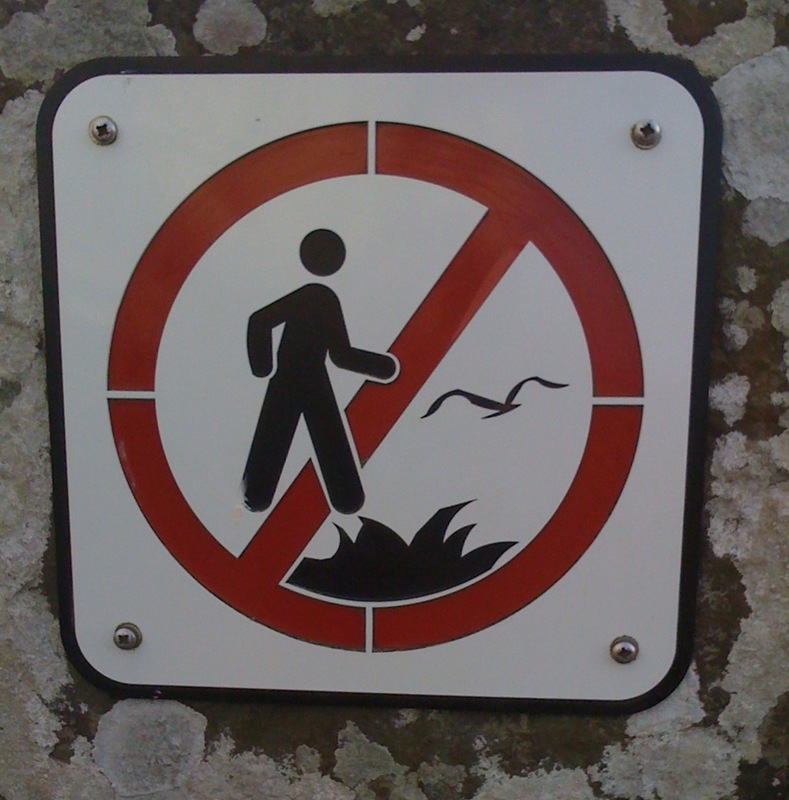 ‘Beware of fire gulls’? The possibilities for misinterpretation seem limitless and would require someone with expertise in a made up academic discipline like “Symbology”–that’s right, I’m talking to you Robert Langdon and you too Dan Brown–to interpret the meaning of the graphic artist here.